As the prices of a single-family home in the capital region continue to hike higher, more and more first-time buyers are looking at purchasing a condo. Not only is the purchase price less but also the down payment requirements, making it easier for buyers to hop into ownership for the first time, and after you’re in, subsequent purchasers can become easier. Plus, with many first-time buyers getting financial help from their parents, buying that first condo is more attainable. With new developments going up all over Greater Victoria and a strong resale market, the selection available to these first-time buyers is ample. Regardless of what your budget or your wishlist is, there is something perfect for you to call home. 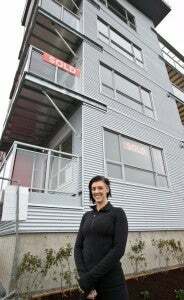 As we near the completion of Bond’s Landing III, the latest phase of condos released in the RailYards community, one of our #CondoExperts’ clients was interviewed by the Times Colonist on her thoughts as a first-time buyer. The full article can be read here: http://www.timescolonist.com/business/condos-appealing-to-younger-buyers-1.2150768. Are you in the market as one of these first-time buyers? Give us a call and let the #CondoExperts help you find the right condo to call home.